5 Lions Gold slot by Pragmatic Play can pay up to 7000x bet! 5 Lions Gold by Pragmatic Play has the huge win potential we have come to expect from this Maltese based developer and their colourful and often Chinese-themed games. The appearance of these games is often very alike and we have their original 5 Lions, 3 Kingdoms and Caishen's Gold to keep this 5 Lions Gold slot company. The reels are on a decorative blue background and you get the almost compulsory Chinese pipes and cymbals music as you spin which gets a bit louder when you get a win. So will these 5 Lions offer our bankroll a bit of bite here? 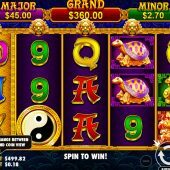 There are 243 ways to win on the 5 Lions Gold slot and symbols can appear both stacked and single aside from the Wild or Ying Yang scatter which is only seen on the centre 3 reels. The pays are odd as we have to pay 18-coins a spin here as the Chinese lucky number is 8. 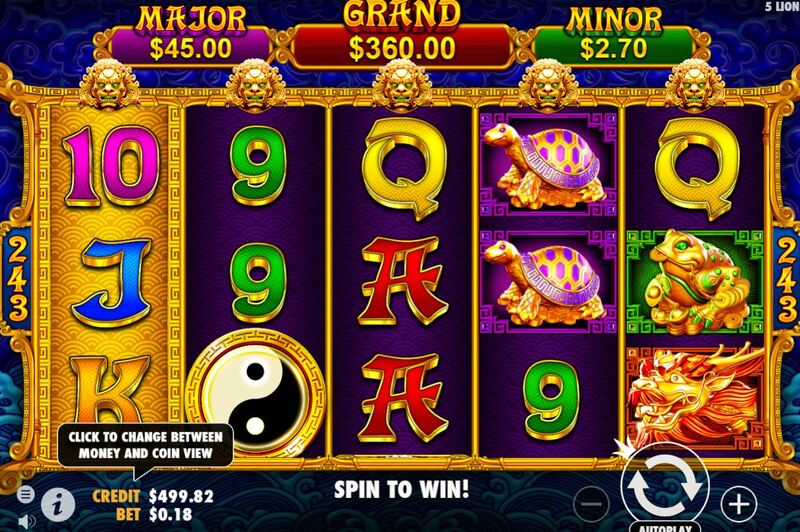 The Dragon pays 126 coins or 7x bet for a 5-of-a-kind win, Phoenix or Frog 81, Fish or Turtle 63 with six card values paying 36, 27 or 18 coins for a full way of 5. There are some far bigger wins possible though as we shall discover. You might notice one or more reels light up Gold on some spins. If you check out the Minor, Major and Grand amounts above the reels these are 15x bet, 250x bet and finally 2000X bet. If you get 3, 4 or all 5 reels lit on any spin you win those amounts respectively. On any spin you can randomly trigger one of the possible free games rounds or a picks game where you select from lucky tokens. The first Grand, Major or Minor jackpot amount to be revealed 3 times will pay that particular fixed jackpot. Having seen Ying Yang on the middle three reels you'll be taken to a selection screen of 7 different options. You can pick from 6 free games where any Wild wins are paid at either 15, 30 or 40x right up to 24 free games where the Wild wins are 2, 3 or 5x with other amounts and Wild ranges in between. The 7th. choice is a Mystery Round where the amount of spins and Wild range is picked separately. Retriggers will not add to your existing free games, but offer you another choice when they end.